Today we are going to be speaking on the different types of loans out there to help you get financing for your future home. Though these aren’t the only loans available to you, these 4 are the most popular choices. 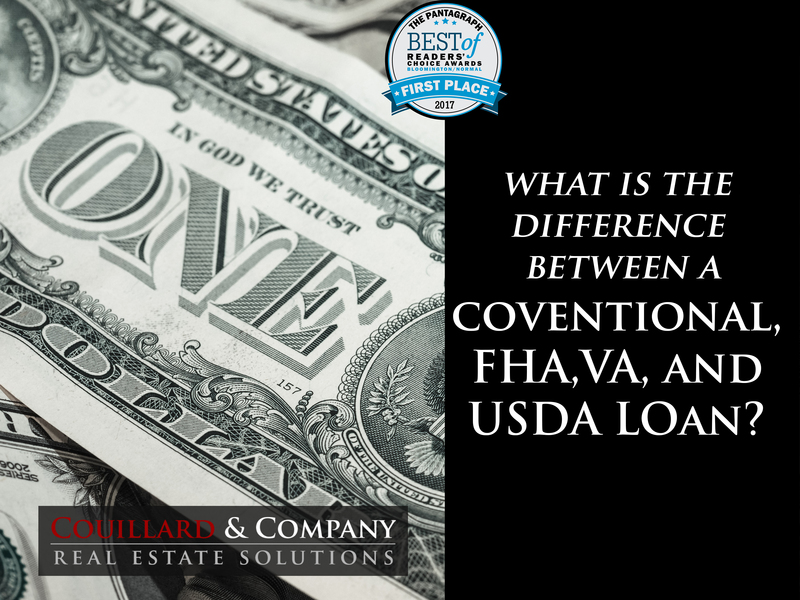 So let’s dive into the differences between the four most popular loan types: Conventional, FHA, VA, and USDA Loans. Ok, let’s move on to Conventional loans. Conventional loans are loans provided by private lenders. These loans are the loans I would advise you to take if you had the cash for a down payment, you have good credit, and you have a good income source coming in(The base this on your DTI ratio, to find out more about that check out this blog post on DTI). This loan will generally take a credit score of 640 or higher (check your credit score here). This loan will require at least a 5%-20% down payment up front but don’t worry if you only have 5%, you will have to pay PMI but that does end when you reach 22% paid off the life of the loan. FHA is a loan administered by the government. This loan is best if your credit may not be where you want it to be, generally speaking, a credit score of 580 or higher is accepted. This loan only requires a 3.5% down payment which is great if you are a first time home buying and don’t have the extra cash laying around for a 20% down payment. You will also be required to pay PMI (Private Mortgage Insurance) and in a typical loan, once you paid 22% of the loan off, the PMI would then drop off and in turn make your monthly payments a little cheaper. In an FHA loan, PMI is paid for the life of the loan (find out an estimate of what your monthly payments would be). This is good and bad. It’s good because it’s a lot easier for YOU as the buyer to be accepted for this loan but it’s bad because you will always have to pay for that loan insurance. A cool feature of this loan is that you can actually get your down payment gifted to you to you! (So I guess there’s no harm in asking for an early Christmas present from Mom and Dad huh? )This loan does have a limit on the amount you borrow and that typically doesn’t go much higher than $270,000. Now on to USDA loans! One of the best features of getting this loan is that you are not required to put anything down. There are some requirements that you need to be aware of before you get your hopes up! First off, the home you purchase under this loan will need to be considered a rural location. The term rural is used lightly though; a lot of suburbs are still able to be considered rural locations. If you are looking to move to a majorly populated area, you may not be able to get this loan. There is also an income limit for this loan. You are not allowed to have more income than 115% of the median income in your county. You DO NOT have to be a first time home buyer to take advantage of this loan but this loan CAN NOT be used for investment properties, you have to actually live in the home you are purchasing with this loan. The upfront costs for this loan and the monthly fee are actually both less than an FHA loan but you will have to continue an annual fee for the life of the loan. Lastly, let’s move on to VA loans. This is a loan to help our current and retired service member have the opportunity to purchase a house. If you are not a current or past service member, you will not qualify for this loan. BUT…if you were a spouse of a service member and your spouse died on an active duty tour, you are able to take advantage of this loan! Just like USDA loans, VA loans do not require any anything down when purchasing the house. There is a one time cost that you will have to pay called a VA funding fee (varies from 1.25%-3.3% of the loan), the specifics of that fee will depend on whether you Active duty, retired, in the reserves, or in the guard. For specifics on that, ask your local lender. Unlike the FHA loan, the VA loan doesn’t have an annual premium, which will save you a lot of money. We hope you learned some valuable information from reading this blog post about loans. We work with some really great lenders that know so much more about how we can finance your dream home! Fill out the form below if you have any questions or would like us to get you the names of some of the lenders we know and trust!